Why do cables use so many different connectors? These are TNC connectors. 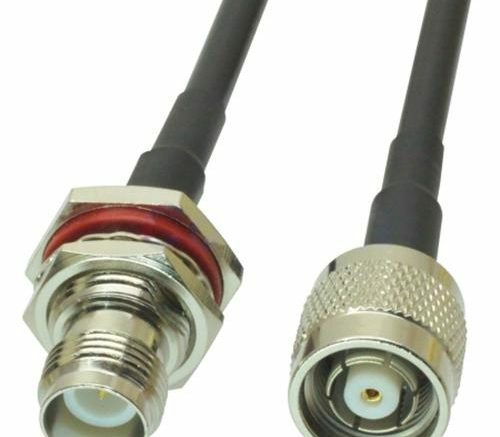 There’s a slight possibility you’ve seen them before but you’re probably more familiar with other connectors like the F and RCA connector you see all the time. It’s used for high-frequency antennas, so you might have seen it if you have a router with replaceable antennas. Otherwise it just might look totally unfamiliar to you. Which kind of makes you wonder, are these manufacturers just sociopaths who enjoy the misery inflicted by forcing all these cables and connectors onto the world? Definitely not. There are actually very good reasons why you would have a different kind of connector for a different kind of thing. In some cases it’s just customary but in other cases there are some very good reasons for it. Let’s take a look. In baseband applications, it doesn’t always matter so much what’s going through the cable. A baseband signal is one that occupies a very large chunk of the cable’s bandwidth, and this usually means old-school video and audio. I’m taking about composite video, audio, musical instruments, that sort of thing. In the past, before manufacturing became as precise as it is today, a specific cable or connector might have been needed but today that’s really not true. So, it doesn’t really matter theoretically if you use 1/4″ (7mm) or 1/8″ (3.5mm) for headphones, and there are adapters that go both ways. Yet home audio receivers use 1/4″ jacks and cell phones use 1/8″ jacks. Obviously you couldn’t put a 1/4″ jack into a cell phone but you could put the 1/8″ jack into a home audio setup. People don’t, because, well, they haven’t before. To some extent this is true as well of the RCA connector used in old video setups. There are other connectors you could use, it’s just not a big deal either way. Because it’s a digital connector of some sort. Digital connections like USB and HDMI need multiple very thin cables instead of one thick cable. It would probably be possible to make one connector that solved all your needs in this way, and the USB-C people are actually pretty close to that, but at least for the last 20 years it’s been common to have each digital standard have its own connector, so you don’t accidentally connect the wrong thing to the wrong thing. This dates back to the early days of personal computers when you spent a lot of time hooking stuff up and it was just easier if things only connected to one thing. Because it uses a different kind of cable. Commercial equipment tends to use 50-ohm cable, while home theater equipment uses 75-ohm cable. Conventional wisdom would tell you that 50-ohm cable is more sturdy and has less loss but the truth is you can build 75-ohm cable just as well as 50-ohm cable and 50-ohm cable can do a pretty poor job if it’s done cheaply. So that doesn’t hold water. So really this is just part 2 of “because it’s always been done that way,” but at least there’s something technical to back it up. Some connectors are definitely associated with 50-ohm cables, like TNC, SMA, and N, while others are always on the 75-ohm side of the street like F. (BNC cables can go either way.) Having a connector you recognize will help you identify a cable as 50-ohm or 75-ohm quickly, since it otherwise would take you a while to find the indication on the cable itself. And then there are a few connectors which actually are designed for a reason. Believe it or not there are some connectors which are shaped in a particular way for a particular reason. Most connectors actually started out with a specific reason for existing, but with high-quality cable and connector manufacturing that reason isn’t as important. There are a few though. The TNC connector is specifically designed to give extra shielding for very high-frequency signals like Wi-Fi and cellular antennas. The USB-C connector and Apple Lightning connector are designed to be small, carry a lot of current, and let you plug them in easily. Even the lowly F-connector has a reason… the center conductor is well shielded from radiation and the screw-on connection won’t pull off easily in the wind. So, even though you’re likely to complain about the fifteen different types of connectors you have to use, you’re also going to end up pretty glad you have them, at least most of the time. DIRECTV receiver just too bright? There’s an easy fix!